The term “generations” often gets used these days, and the difference between people of different ages is attributed to when they were born, and which letter of the alphabet has been assigned to them (X, Y etc). While there is an element of subjectivity as to how you define a generation, the “baby boomers” are a group which is very important in understanding the demographics of Australian society. Those born immediately after World War II when the birth rate was very high have had a substantial impact on Australian society, and still shape the demographics that come out of each Census. When did the baby boom start? I’ve been investigating historic birth rates for a while at .id. I recently put together a blog post about the decline in 25-34 year olds, which led me to the ABS website. Births, Australia (3301.0) comes out each year and has a fascinating chart which we’ve used a few times, showing an 80 year snapshot of Australia’s birth rate. The “baby boomers” were born in the baby boom which followed World War II. As a name for a generation it is quite a good one. It’s well known that people tend to have more children in good economic times, and the 1950s were certainly good economic times as the western world recovered from the largest war ever fought. The baby boomers exist in all western countries which were affected by World War II. The interesting thing which I didn’t know is that while the UK and US experienced a very large spike in birth rate as soon as the war ended, in Australia it was more of a long sustained build-up. The birth rate in Australia was actually at its lowest point of 2.11 (the theoretical number of babies the average woman would have in her lifetime if the fertility rate in that year extended through her life) in 1934, in the depths of the Great Depression. Notably this is still higher than the level we are currently calling a “mini-boom” which peaked at 1.97 (more here). This rate rose steadily through the rest of the 1930s, and the 1940s, so contrary to popular belief it was rising throughout World War II in Australia. By 1945 it had reached 2.74. Then it shot up much further as the soldiers came home from the war and the economy began to boom in the following 15 years. The birth rate reached a peak of 3.55 in 1961. 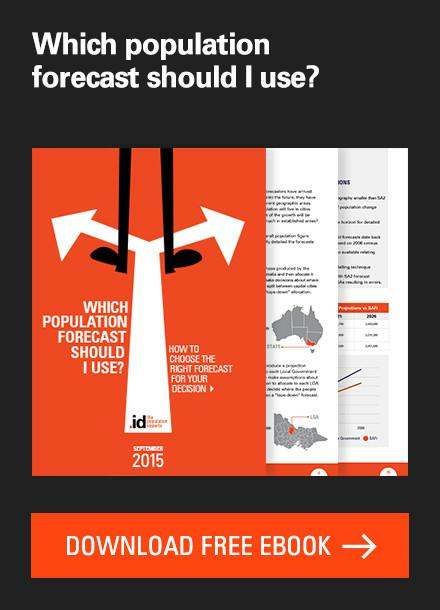 All this comes from the ABS publication Historical Population Statistics (3105.0). When did the baby boom end? Despite the rise in birth rate before the end of WWII, the first baby boomers are universally considered to be those born in 1946, but different people set the end date of the baby boom at different points. 1961 was the introduction of the contraceptive pill, and 1962 saw the first significant decline in birth rates in nearly 30 years. 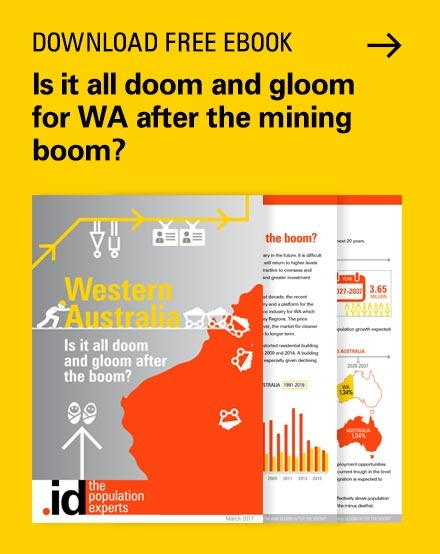 Most commentators put the end of the baby boom about 1964 in Australia however. Part of the reason for the ambiguity is that it’s hard to define a “generation” by arbitrary dates. Babies are born every day and you can’t say that someone born on 31 December 1964 was a baby boomer but the baby born on 1 January 1965 was Generation X. Of course people do, but in reality like most things it’s a continuum. The other thing to note is that mostly these generations are defined not in purely demographic terms but in cultural terms – the events and social changes that they lived through in their childhood and teenage years. So for the baby boomers it’s things like the space race, Vietnam, Kennedy assassination, Menzies as prime minister, Woodstock and Sunbury music festivals, the hippie movement, civil rights, equal pay movement for women and so on. Again, these things will have different effects on someone born in 1946 to someone born in 1964. How are the baby boomers shaping society today? 50-59 year olds increased by 331,000 people over 5 years, and over 1 million in 15 years. These people were born between 1946 and 1955, and in the 2011 Census we can expect to see the big increase in those over 60, as the bulk of the baby boomers move into this age group. This is why as a society we have been planning for an ageing population for quite a while – the shock of such a large cohort of people retiring from the workforce and living longer as well (life expectancy is now 79 for men and 84 for women) will place a significant strain on the economy. Once the baby boomers entered their mid 20s, from about 1970 through to the late 1980s, it was expected that we would again see an increase in the birth rate, with the so-called “echo boomers”. While there was a small echo boom in the USA, it’s not apparent on the Australian birth rate chart. It never happened because women kept having children later and later in life, and having less of them than their parents. It wasn’t until the early 2000s that the birth rate started to uptrend again. See my article on the baby bonus for more information. Those born in the “baby bust” years following the end of the baby boom in the mid-60s are usually known as “Generation X” while the following generation, predominantly the children of baby boomers, is usually known as “Generation Y”. More about those generations in my next article. 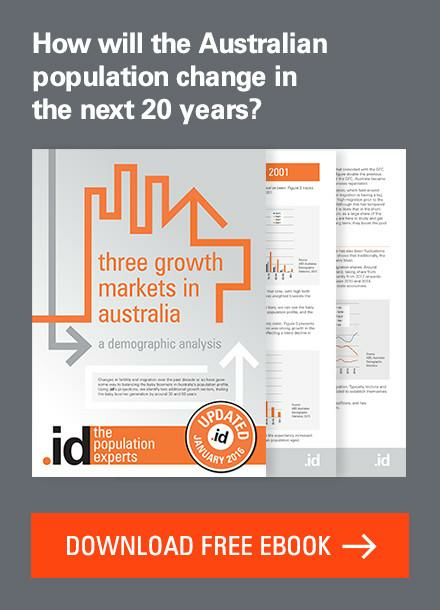 We will be looking carefully at the 2011 Census data to see what the baby boomers are doing across Australia. Are they retiring from the workforce? Are they moving to sea-change destinations? 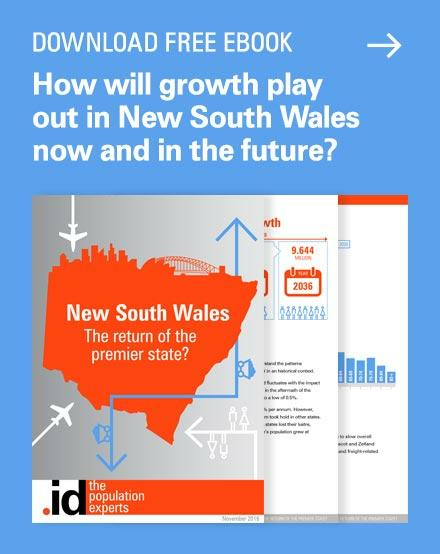 Are they increasing the size of their houses after their children have left home? And are their children leaving home or staying with them? 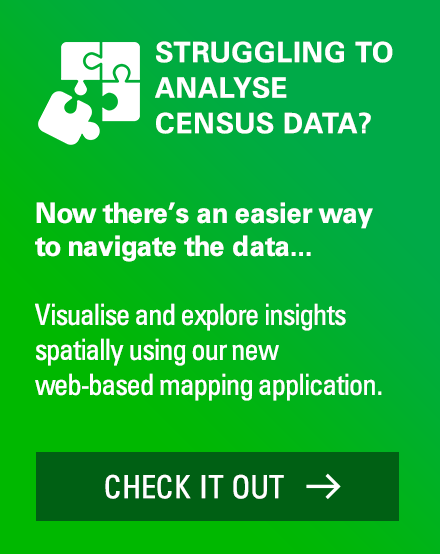 Only 3 months to go and we will have access to the wealth of information from the 2011 Census which will be going on the profile.id sites soon after. Stay tuned! 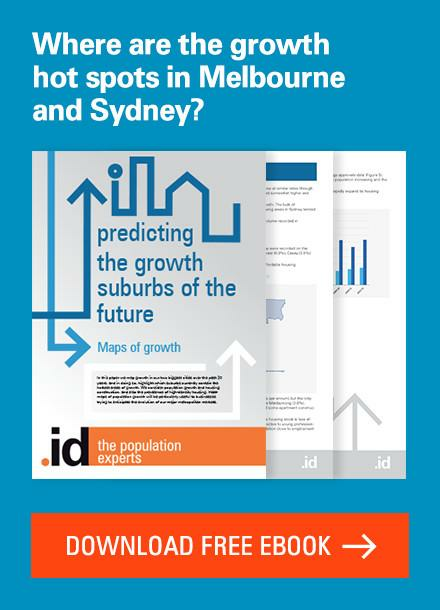 If you need any assistance with understanding the data in profile.id, feel free to contact the population experts at .id (03) 9417-2205 or info@id.com.au. 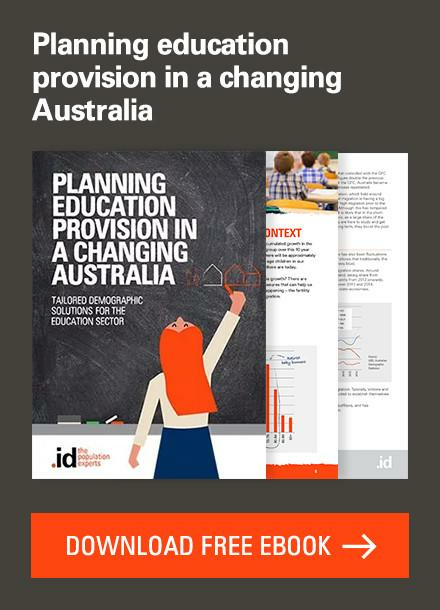 And do follow us on Twitter @dotid or check out our website at id.com.au for more information about population change in Australia. 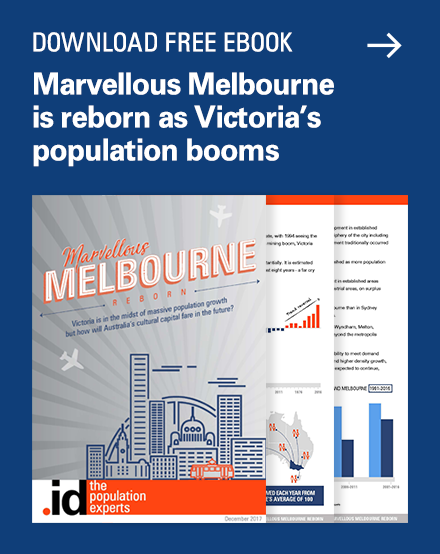 Who will win the race to be Australia’s number 1 capital city? Not far into your article I realised that you were younger than us boomers. Your mother probably didn’t have a book on her bookshelf titled “Populate or Perish”. As the World prepared for war (a disgusting concept to me), during the war and shortly after a government campaign coerced women of reproductive age to go forth and multiply – frequently. Fortunately for me my mother only had two children which meant we could eat better than many families in our street for times were not as rosy as you suggest for salaried workers. This situation continued until the rise of unionism in the 70’s, as part of the people’s revolution, introduced more equity into Australian society. Next story Which States are the winners in the migration game?